A snack used to be something enjoyed occasionally, often to stave off hunger and coast in comfortably to the next meal. Today, it serves multiple purposes. Meals have undergone many changes reflecting the reality of the times, the pressure of work, the drive to keep up and a healthy obsession with health. Perhaps no meal has changed so much as the snack. And while the modern snack might typically be composed of healthy ingredients, more often than not the act of snacking conflicts with how we were raised: Too much snacking spoils our dinner. The norm in most healthy traditional cuisines has been that snacks should act as occasional meal extenders consisting of nutritionally dense staples such as nuts, seeds, whole grains, beans, meats or cheeses. Fast forward to today’s fast-eating era. The lifestyle changes that have shortened meal times and meal prep times, coupled with a constant requirement of energy, means consumers sit down to fewer prepared meals. This means snacks become a necessary substitute. Definition, here, is critical, however. Simply put, American consumers are not substituting these calorie-dense, meal-substitutes but maintaining their behavior of using snacks as a tide-over between meals. Grab-and-go snacks that are higher in calories and in real sustenance than should be acceptable for basic staples have played a big part in the rapid increase of obesity and type 2 diabetes. Both (often related) disease states have corresponded closely with this changing dynamic. While there are many contributing factors to the modern health crisis, the association with nutritionally dense portable foods is not merely temporal. Look at the USDA food availability, adjusted for loss, tracking food groups that have increased since 1970 (before the steep climb in obesity). Of the nearly 500 kcal increase in the average American’s diet, the majority come from added fats and oils, followed closely by flours and cereal products (not whole grains) and more distantly by sugar. To this end, processors are challenged with reformulating snacks to match modern energy demands but without breaking the calorie bank. This can be accomplished by improving the nutrient density and quality of ingredients, without cramming 300 calories into a 2.5-oz. bar or similar item. As most snack foods tend to be grain-based, a good place to begin reformulating snacks is by increasing the proportion of whole grains to simple calories or calories from unhealthy fats or “empty” carbohydrates. Such an upgrade in nutrient balance presents some hurdles, but ingredient technicians have been following the trends and creating some rather adept solutions. Saffron Road's snacks hit on several snack positives: trendy ingredients, trendy flavors, protein, organic, non-GMO, halal, gluten-free. Zammer also notes that the equipment used for traditional snack manufacturing might also need to be modified or supplemented with other equipment to work with gluten-free dough, as such dough formulations “tends to be more fluid.” TIC Gums Inc., White Marsh, Md., has developed a number of innovative solutions to assist in maintaining the integrity of gluten-free dough. The gluten-free/wheat-free phenomenon has pushed the envelope of consumer experience when it comes to new grains, opening inviting new ingredient channels for snack creation. Quinoa, once an obscure offering, is now mainstream. “There are many varieties of grains that we have not fully explored yet in American cuisine,” continues Zammer. “The quinoa and amaranth we have seen appearing with greater frequency on menus of late are typically one white variety, but there is black quinoa, red amaranth, and purple barley that have yet to be discovered by consumers. Gridley, Calif.-based Mary’s Gone Crackers Inc. applies the organic whole-grain theme with whole quinoa, millet, amaranth and a variety of seeds to make a line of whole-grain, vegan, gluten-free crackers, pretzels and cookies. Glutino Food Group Inc., Boulder, Colo., is an example of a company that has specialized in gluten-free foods exclusively. A pioneer in the business, Glutino has provided consumers who must live or choose to live gluten-free with an endless variety of products for more than 30 years. The company has an extensive snack menu, often employing quinoa, buckwheat and other ancient or heritage grains into its formulas, as well as those products that include staple gluten-free grain sources of starch, such as rice, corn and tapioca. Boulder Brands' Glutino brand has long specialized in gluten-free products, bringing that attribute to previously unavailable products, such as toaster pastries. The population suffering from celiac disease, the condition that demands gluten-free foods, is relatively small — only about 0.7 to 1 percent of the population. Another 4 to 10 percent or so are believed to be sensitive to gluten. However, gluten-free foods have attracted a much greater following. Some grains are attractive simply because they contain less gluten, and so are well-suited for such “low gluten” formulations. Rye and spelt are two such relatives of wheat that have strong ties to tradition. Rye is higher in fiber than wheat, and contains fiber in both the bran and endosperm, which can help naturally boost the fiber content of a finished product, especially when the whole grain is used. “Rye and spelt are highly nutritious grains, and do contain gluten, but with different amounts and ratios of gliadin and glutenin (gluten-forming molecules),” explains Zammer. “They do not tend to form the elastic network that you find with wheat, and therefore are often combined with wheat in a baked product. An example of a snack steeped in tradition, but relatively new to Americans, is roasted garbanzo beans. Saffron Road Inc., Stamford, Conn., produces these nutrient-dense snacks that are high in protein and lower in fat than most roasted snacks. This and similar roasted or dried chick pea snacks have been quite popular among consumers seeking to boost protein in their diets. They have proven especially popular with athletes. Saffron Road’s versions are Non-GMO Project Verified, made with organic chickpeas, as well as certified gluten free and halal. The oil is used in minute quantities, more to contribute to the flavor and texture by holding the seasoning to the beans than for the cooking. Modern specialty oils that contain long-chain omega-3 fatty acids (e.g., DHA and EPA), such as Cargill’s IngreVita, are suitable for major categories of shelf-stable and refrigerated products in applications ranging from bread, bakery and snacks to meal replacement beverages and dairy. However, they are not suitable for deep-frying applications. It is no coincidence that the healthier the oil, the less it is suited to deep frying. “One of the major issues in formulating snacks using fats rich with omega-3 fatty acids can be flavor deterioration, due to the high oxidation rate of omega-3 fatty acids," continues Iassonova. "However, this issue can be addressed by selecting oxidative stable specialty omega-3 oils. Iassonova notes that cost can be a limiting factor for omega-3 oils; however, omega-3 fatty acids differentiate product on the shelf as “healthy and nutritionally advanced." More importantly, the majority of consumers are aware of omega-3's health benefits. Capitalizing on the natural popularity of fruit flavors for snacks can be a science in itself. “We have several unique, plant-based extract and natural fruit flavor platforms that are based on not only on identifying aroma compounds, but also understanding relevant organic acids and complex carbohydrates of named fruits,” says Donald Wilkes, president and CEO of Blue Pacific Flavors Inc., City of Industry, Calif.
“Our original work with Plant and Food-New Zealand provided a window into how Mother Nature creates flavor and how that drives consumer preference. It’s quite different from what is generally understood in traditional flavor science. We saw from their proprietary fruit compound database analysis of their fresh fruit library the importance of how other non-volatile compounds like organic acids and complex carbohydrates can play on taste and flavor delivery. “As the consumer demand for ingredient authenticity evolved, we saw a need to redefine real fruit flavors that are based on what we call ‘farm-to-flavor’ rather than ‘chemical-to-flavor’ in light of our natural food clients’ desire for transparency and clean-label concerns,” Wilkes explains further. Blue Pacific’s FarmStand Whole Fruit Flavors line was created to offer food and beverage companies greater authenticity when using its exclusive natural fruit flavors. The company incorporates high levels of natural fruit extracts that characterize the finished product, and can also clearly be communicated as a “clean labeled” natural flavor,” according to Wilkes. “Typically, Natural Flavors can function well in applications that have simple ingredient matrices and reasonable processing conditions,” Wilkes notes further. “The key is to engineer application formulations where Natural Flavors don’t get exposed to extreme heat or ingredient interactions.” He explains that those conditions can impact their flavor stability and overall consumer acceptability. Wilkes also points out how confectionery processes also can create challenges for natural flavors, “given their artificial counterpart offers higher impact after thermal processing than most natural flavors.” Exceptions he points to include natural citrus flavors and other essential oils used in candy manufacturing. “At Blue Pacific, we have developed several proprietary flavor delivery solutions to avoid natural flavor absorption in a variety of food, beverage and confectionery applications,” he states. Carrying through the theme of employing simple ingredients when working with fruit flavors, WhiteWave Foods Inc.’s Horizon Organic Dairy, Broomfield Colo., just launched a line of low-fat, fruit-enriched snacks in the form of fruit chews as a way of introducing omega-3 fatty acids to kids snacks in an enjoyable format. The source of omega-3 is algal DHA. Also in the snack category, the Horizon brand is debuting Fruit Crunchers in apple-cinnamon and toasted coconut flavors and Apple Clusters. While the likelihood of returning to an era when we had more time to prepare food seems slim, health-conscious consumers are demanding healthier snacks. The continuing healthy tradition and the rapidly growing clean label movement will bring more and more scrutiny of product labels. 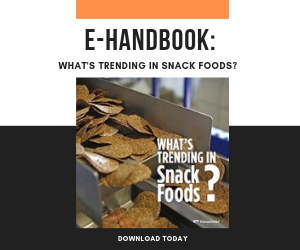 Processors can get ahead of the game by using modern ingredient options and advanced techniques to create next generation snacks that balance reasonable caloric density with flavor and health. 11 top food companies present to the Consumer Analysts Group of New York. How Do you Create a Healthier Savory Snack? Big opportunities available for food manufacturers wanting to produce new snack foods. Consumer time and health push snack foods to the forefront for many packaged-food companies.